An amorphous, hydrogel dressing proven to reduce pain intensity without side effects. Proven to reduce both pain and itching in cross-over study. 2% lidocaine HCl reduces pain and inflammation and breaks the itch and scratch cycle. Medium, molecular weight polysaccharides in aloe vera reduce inflammation, moisturize, plus stimulate microcirculation and immune factors to help heal wounds quickly. Marine collagen acts as humectant, providing a natural barrier. 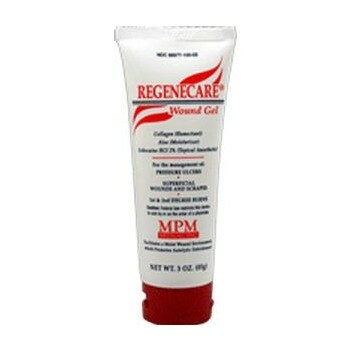 Regenecare® contains sodium alginate to absorb drainage. Contains sodium alginate to absorb drainage and the collagen, vitamin E, aloe vera combination assists the body in healing itself.